Ask most physicians what they think of the technology they are required to use in their practices and hospitals, and you'll get an earful. 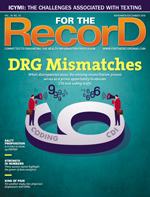 The Office of the National Coordinator for Health Information Technology (ONC) and the Centers for Medicare & Medicaid Services certainly did earlier this year at a "listening session" they organized to gather input from physicians and other health care stakeholders about reducing the clinician burden associated with HIT. Problems frequently mentioned by commenters included poor EHR workflow, poor system usability, and overdocumentation (aka "note bloat") driven by billing requirements. Such anecdotal evidence is supported by quantitative research. For instance, a Deloitte study found that 3 out of 4 physicians believe EHRs increase practice costs, outweighing any efficiency savings, and 7 out of 10 think EHRs reduce their productivity. ONC's chief clinical officer, Andy Gettinger, MD, is on record as saying, "I don't believe our work will be done until EHRs and other health IT tools are things that clinicians who are taking care of patients can't imagine taking care of patients without, because they need them." Amen to that, but it will take some doing. First, a bit of context. A physician's biggest pain point before the advent of EHRs was not having access to enough data. They were siloed, typically in dusty paper charts buried in the basement or off-site storage. Physicians never felt as though they had a comprehensive view of the patient. With EHRs, we should have better access to patient information, but, ironically, it's often buried in a sea of redundant or irrelevant data. Additionally, it may be in an inconsistent format, which makes finding the pertinent information challenging. The fundamental problem stems from the fact that the current generation of EHRs fell victim to the "automate what is there" problem. Almost all EHRs present the same information the same way, regardless of the user's specialty, the patient situation, or the care setting. This is because these EHRs are modeled after the paper chart. It is impossible to make a paper chart dynamically adapt and present the most pertinent information given the situation, but it is possible to have computers do this. Consider that not too long ago consulting physicians had to spend the night in the hospital just in case their expertise was required. Then came pagers and cell phones, and consultants were able to come to the hospital only when and as needed. Now technology allows providers to completely review up-to-the-second information about a patient and properly triage that patient directly from the provider's mobile device. This is both a practical solution for delivering care more efficiently and a form of respect for a physician's time and expertise. Unfortunately, there are many examples today of HIT disrespecting physicians. An examination of physician satisfaction data shows that well-intentioned changes have had devastating effects. Physicians are overwhelmed with alerts that question their decision-making process or ask irrelevant questions related to every patient update. When hospitals install computerized physician order entry (CPOE), they retask the order clerk and create an additional clerical job for the physician. The industry appropriately devised CPOE to improve care, but due to complex workflows and subsequent workarounds, results have been suboptimal. Instead, health care has gone in the opposite direction of every other industry: It added technology but reduced the productivity of its most valuable human resources. And the kicker is adding technology didn't result in lower overhead. In fact, facility costs to treat each patient, on average, have risen. The same is true for clinical notes, which have expanded to encompass numerous pages that regurgitate information contained in the EHR instead of being a concise, curated document that highlights the critical aspects of a patient's care and the clinician's thought process. Research has shown that US physician notes are four times as long as those of their overseas counterparts. As a result, notes are soaking up a lot more of physicians' clinical time. This is not the way it was supposed to work. In the mind of a physician, EHR usability refers to accessing and acting on patient information with ease. It's having data presented in a manner that is consistent with the physician's unique thought process and workflow, allowing him or her to synthesize and intuitively act on that information on the fly. It also means doing no harm. A recent study from the American Journal of Managed Care suggests that the amount of usability-related harm associated with EHR use may be underreported. Poor EHR usability can hamper a physician's ability to find data and act on results, delay orders, and fracture the provider's train of thought. Technology should not burden physicians. Rather, it should be a valued resource to help them be a little sharper, more efficient, and better equipped to interact more frequently with patients. For example, it can take a hospitalist as long as one hour to conduct morning prerounds. Imagine having a computer system that can help streamline the process by highlighting critical overnight changes and helping prioritize daily tasks in an intelligent manner that is consistent with how that physician practices. Such a breakthrough would get physicians on the floor sooner and to the patient's bedside earlier. In broad strokes, physicians should have one foundational system with which they interact—all other applications should simply coexist within that environment. There should be an adaptive user experience—the information presented should be specialty, patient, and situation specific. Envision an electronic environment in which dashboards can be configured for various specialties—hospitalists, intensivists, and obstetricians—and patient conditions such as diabetes, sepsis, and postpartum care. Where dashboards are completely customizable based on role, specialty, and even user. Where different information, layouts, and options are available depending on what is important for clinicians to see and access in order to care for their patients. Where dashboards can adapt to workflows, such as prerounding and discharge, to display the most pertinent information based on the situation. Where condition-specific dashboards contain curated information about the patient's condition, enabling a physician to see everything that is relevant in one place without having to search through reams of data. That is how the transformation of physician IT from burden to asset can start to take shape. If physicians weren't devoting half a day to the EHR, they would have more time to spend with patients. It's that personal aspect of care that technology can support but can't replace, and which the vast majority of physicians so desperately crave. Physicians want to practice at the top of their license; they want to spend their time practicing the art of medicine, not servicing its insatiable administrative appetite. To reach these heights, the industry must empower physicians with tools to advance the cause of more personal care by delivering a more personalized HIT user experience. — Christopher Maiona, MD, SFHM, is chief medical officer at PatientKeeper.